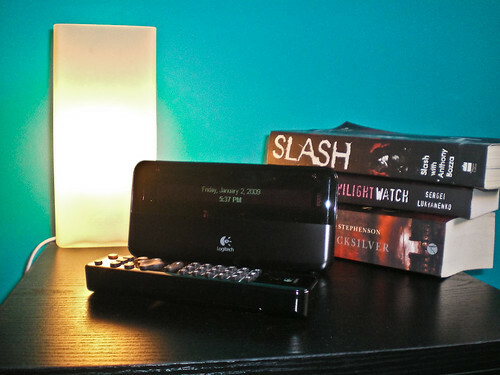 My favourite new toy of 2008 was definitely the Logitech Squeezebox. This little beauty has meant I can now play music while I’m drifting off to sleep – something I’ve really missed over the last few years. Subliminal Slayer playing directly into my ears while I was sleeping as a youngster no doubt made me the cheerful, positive person I am today. Essentially the Squeezebox is a little wireless receiver with speakers and a remote control. It taps into our media box and streams MP3s to wherever you put it (in our case, the bedroom – the only room that’s too far away from the main room to get the benefit of the stereo). Of course, there’s now a newer version of the device with a screen on the remote and a proper volume knob. Santa passed us by this year, unfortunately. What I’ve found to be relaxing enough to fall asleep to has surprised me somewhat. I’ve progressed from Alice in Chains and Nirvana Unplugged (obvious “quiet” choices) through to Danzig II and November’s Doom (also fairly quiet) to the classics like Obituary, Sepultura and Megadeth, which don’t at first seem like soothing choices but which seem to do the job. Do you listen to music when you sleep? What gets you snoring? ~ by goat_admin on January 2, 2009.
oddly enough, I have found the same. Very heavy and loud music can sometimes send me off more quickly.